Having such a leisure vibe in the home is everyone’s dream. They can create a themed room or decorate it with the favorite landscape decoration. If you like the sea vibe, the blue sea, and the brown sand, you can get the hues inspirations from it. 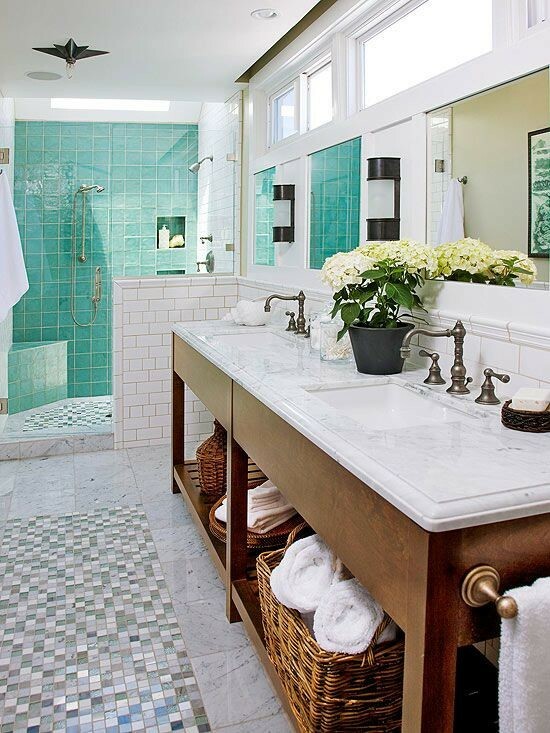 The beachy bathroom can be created by applying the beach hues. It can be sandy brown, blue, crystal blue, and even white as for there are many white boats and houses on the beach. You can add some decorations which represent the sea. Bathing will feel like you are next to the sea and give so much refreshment. 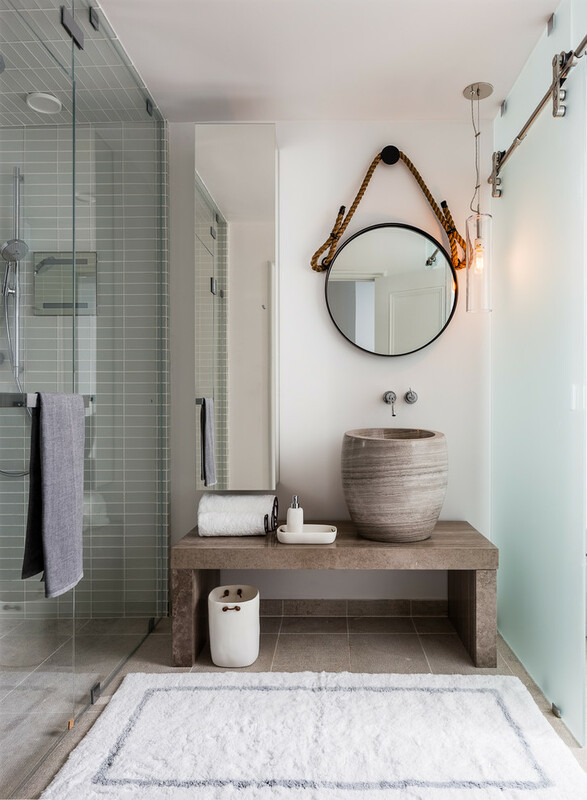 Here, you can find some inspiring beachy bathroom ideas that will give you the inspiration to create a unique bathroom in your home. 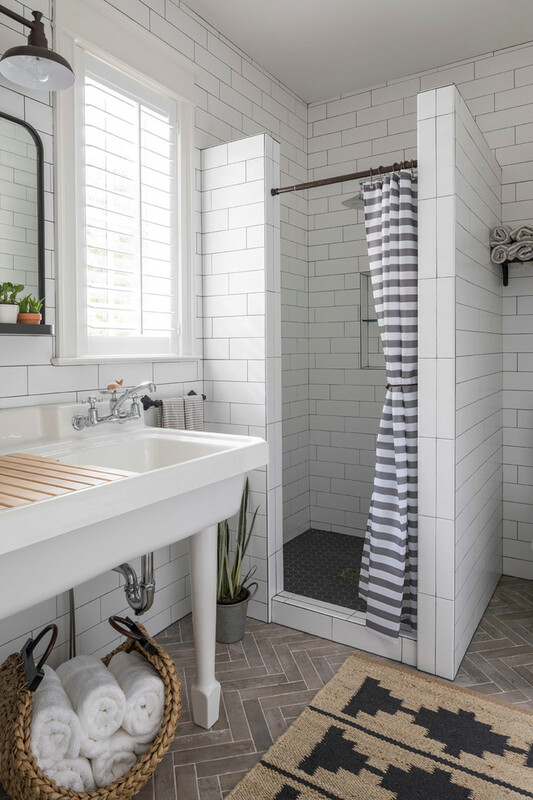 This small bathroom features a built-in tub, a white freestanding sink, and a white chair. Although it has minimalist features, it still makes a functional and fabulous bathroom. The glass blue tiles on the walls and tub make it feel very French, fancy, and clean. 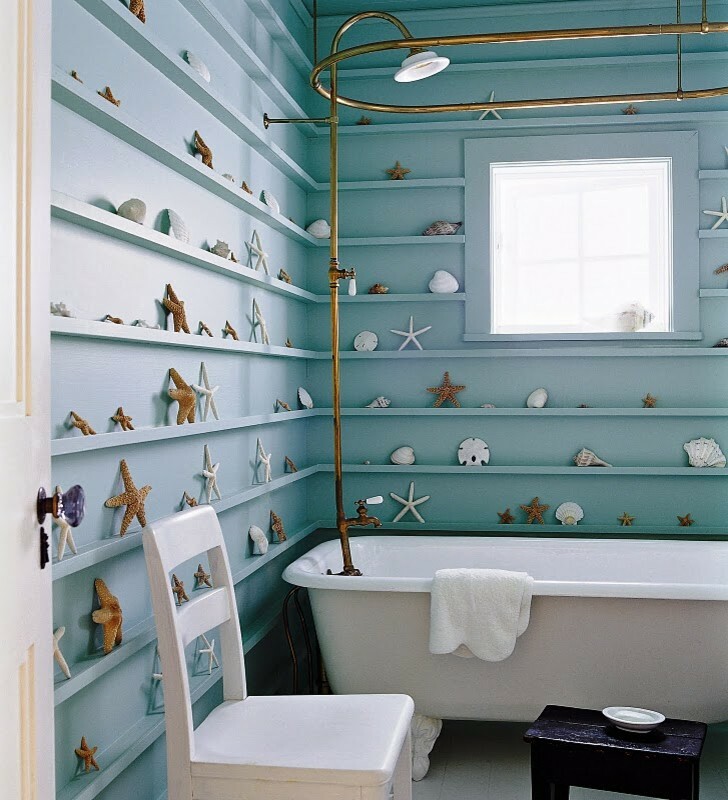 Filling the shelves around the wall of this bathroom with decorative beachy items is a good idea. It will be even better if the pieces which you’ve collected yourself from your trip. If you have a small budget but still want to decorate the bathroom and create a beach vibe, this bathroom will be a very good example. 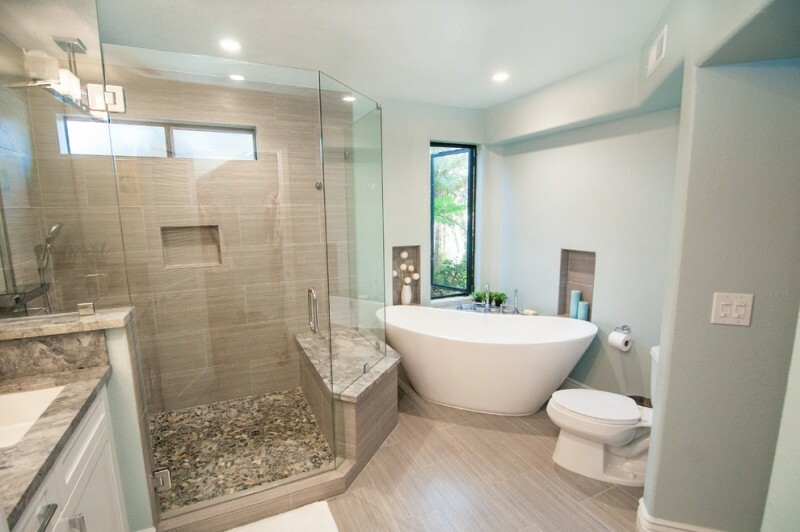 This bathroom features a freestanding tub, a spacious shower space, and vanity. The shower space flooring is designed to have coastal sand with sandy gravel flooring or mosaic floor tile. 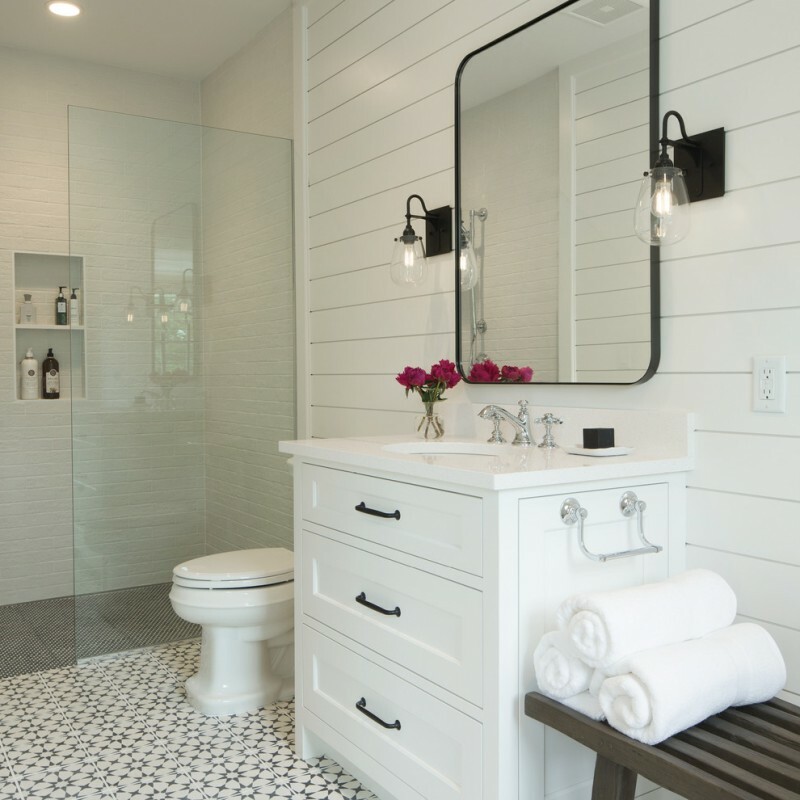 This clean white bathroom looks so clean with the white hue which makes it fabulous. The freestanding tub is placed next to the window and between the white vanity. A coastal chandelier is installed to give a unique accent. 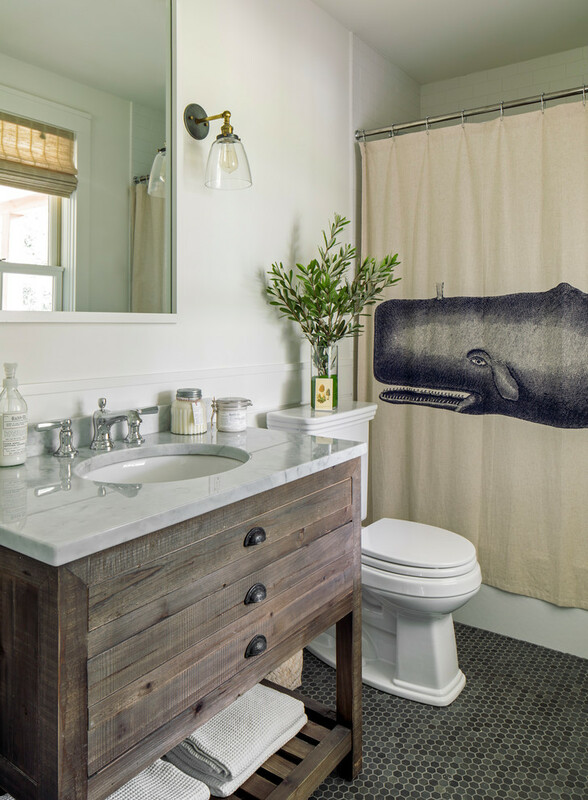 Beside the glass coastal wall sconce and wooden vanity, the whale curtain emphasizes the beachy bathroom vibe. This curtain is so unique and can blend into the bathroom style easily while giving so much privacy. A coastal color palette can give a room an East Coast Chic style. The black color on the wall sconces, wall mirror frame, the drawer handle, and the flooring gives a nice accent to this white bathroom. 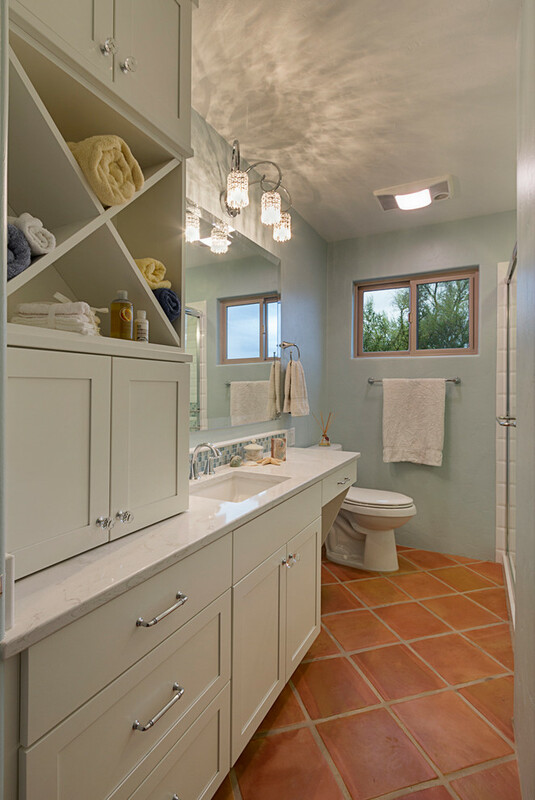 Add this white cabinetry to make a beach style bathroom. This cabinet has enough storage to keep the bathroom needs. You can put some towels on the cabinet shelves. Terra cotta floor tile is chosen to give the sand hue. C K Cabinetry and Design, LLC. 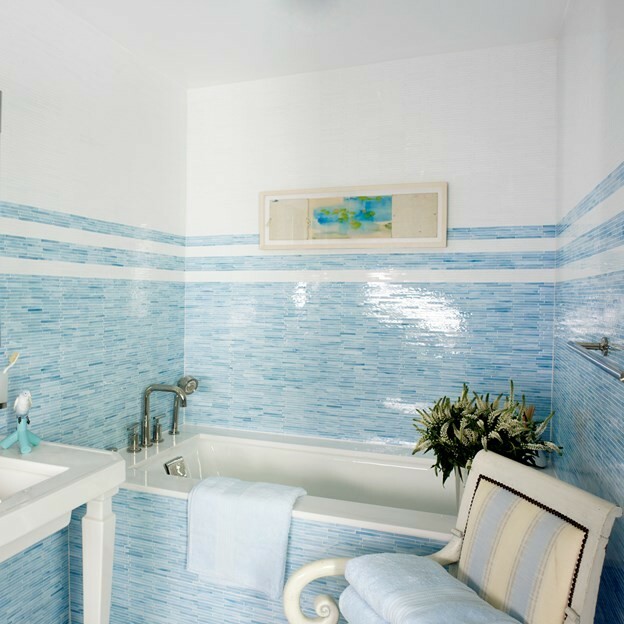 This bathroom offers the blue glass tile on the shower space which makes it looks so refreshing while having a sea vibe. Install a skylight on the shower space to get the outdoor feel. You can go a step more dramatic with this hanging mirror. It is completed with a chunky strap which is so durable and unique.